On October 29th, 1960, Louisville Boxing legend Muhammad Ali (known as Cassius Clay until his name change in 1964) made his professional debut at Freedom Hall in Louisville, winning a six-round match against professional boxer and police chief of Fayetteville, West Virginia, Tunney Hunsaker. Also born in Kentucky (in 1930 in Caldwell County) the more seasoned Hunsaker, whose eyes had been swollen shut during the fight, spoke graciously of his defeat according to a 1961 article in The Ring Magazine, remarking "Clay was as fast as lightning" and "I tried every trick I knew... but he was just too good!" Ali, also known as The Louisville Lip, was well known for his trash talking of rival boxers but in regards of his first professional opponent, Ali spoke highly of his talent, remarking that one of the hardest hits he ever received in the ring was delivered by Hunsaker. Hunsaker's boxing career ended just two years later after a knockout punch by professional boxer Joe Shelton left him in a coma for nine days. Hunsaker recovered and continued to serve Fayetteville West Virginia as police chief for 38 years and was inducted into the Law Enforcement Hall Of Fame. According to Ali's autobiography the two remained good friends throughout their lives. 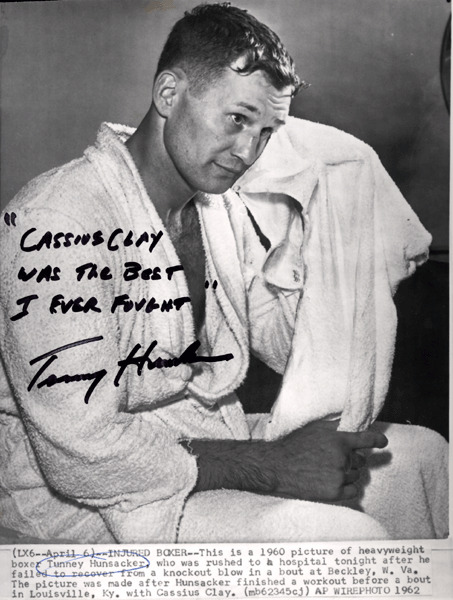 Tunney Hunsaker died at the age of 75 in 2005 after a long battle with Alzheimer's Disease. 1961 article "Glove Action" in The Ring Magazine.